We've all tried talking with devices, and in some cases they talk back. But, it's a far cry from having a conversation with a real person. 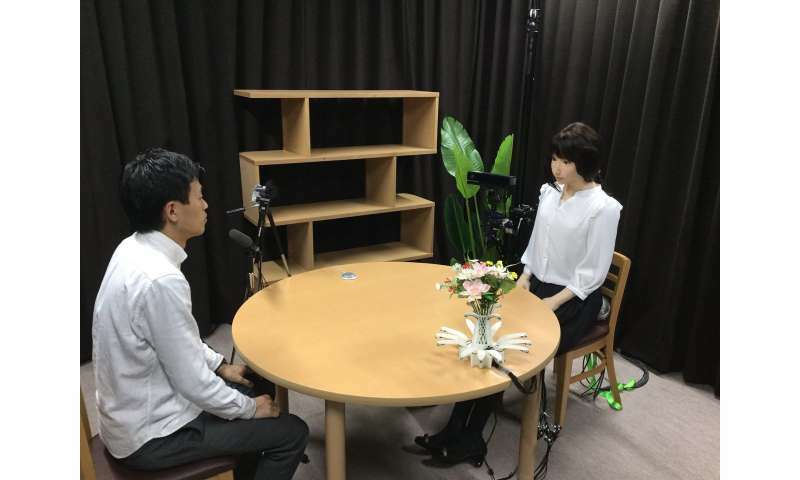 Now, a research team from Kyoto University, Osaka University, and the Advanced Telecommunications Research Institute, or ATR, has significantly upgraded the interaction system for conversational android ERICA, giving her even greater dialog skills. "When we talk to one another, it's never a simple back and forward progression of information," says Tatsuya Kawahara of Kyoto University's Graduate School of Informatics, and an expert in speech and audio processing. "Listening is active. We express agreement by nodding or saying 'uh-huh' to maintain the momentum of conversation. This is called 'backchanneling,' and is something we wanted to implement with ERICA." The team also focused on developing a system for "attentive listening." This is when a listener asks elaborating questions, or repeats the last word of the speaker's sentence, allowing for more engaging dialogue. Deploying a series of distance sensors, facial recognition cameras and microphone arrays, the team began collecting data on parameters necessary for a fluid dialog between ERICA and a human subject. "We looked at three qualities when studying backchanneling," continues Kawahara. "These were: timing—when a response happens; lexical form—what is being said; and prosody, or how the response happens." Responses were generated through machine learning using a counseling dialogue corpus, resulting in dramatically improved dialog engagement. Testing in five-minute sessions with a human subject, ERICA demonstrated significantly more dynamic speaking skill, including the use of backchanneling, partial repeats, and statement assessments. "Making a human-like conversational robot is a major challenge," states Kawahara. "This project reveals how much complexity there is in listening, which we might consider mundane. We are getting closer to a day where a robot can pass a Total Turing Test."